Ryde School students have enjoyed another very good year of A level results, and equally good results in the International Baccalaureate (IB) which the School entered for the first time this summer. In the IB, students must face the considerable challenge of taking three subjects at a higher level and three at the standard level, across a broad range of subjects. When combining the higher level IB subjects and A level subjects, our students achieved these results: 42% of entries were A* or A grades; 73% of entries were A* to B grades; 91% of entries were A* to C grades and our pass rate was 100%. 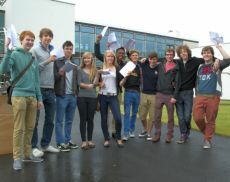 At A level the two highest scoring pupils were Henry Clifford and Xiaolingfei Lu each with 3 A* grades, then Scott Armour, Joe Ashworth, Tom Au, Jake Clifton, Katie Eaves, Adam Foster, Andrew Goddard, Robert Green, Justin Hui, Laura Grubb, Robert Hothersall, Charlotte Price and Claire Watt all earned the equivalent of 3 A grades or better. In the IB, four students achieved the equivalent of 3 A grades in their higher subjects. They were: Bethany Bowen, Mark Krall, Will Ockendon and Maria Stefil. 7 Comments on "Ryde School A-level and IB examination results 2012"
Do you sour milk by just looking at it? I believe Ryde private is actually non selective.. Unless you count ability to pay the fees! Congratulations to the students – but let’s not forget the advantages they enjoy compared with kids at Island schools who again fell below the national average. I see “Woolly Bear” takes the ususal ad hominem approach to argument for those with nothing to say. It would be better to respond to the point, not the person. And not to hide behind a false name. I’m with you Chris – nicely articulated and a learning experience for me so early in the day. I search ‘ad hominem’ on Google and Wikipedia – now a new addition to my vocabulary. To take this further ….. it’s interesting that SO many people use an alternative to their real name. OK its abused by some but for the most I’m guessing that its akin to the time after the abolition of the Hustings where people felt they could have their “say” without fear of reproach.